The damage done to Marcus Lattimore's knee Saturday was depressing; great player, great kid, great future, bad injury. The outpouring for the South Carolina running back, however, was a testament to the positivity of what college athletics can be – and unfortunately, thanks to the myopia and pettiness of Lattimore's own coach, Steve Spurrier, what it too often isn't. Immediately after Lattimore's injury, much of the Tennessee team joined South Carolina players at midfield to pray and honor him. Well-wishes poured in from across the country on social media. 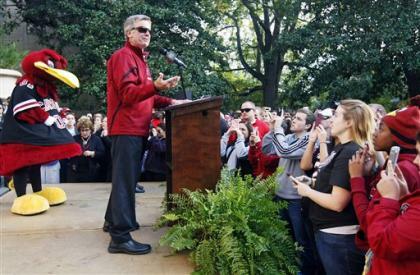 The Governor declared Monday "Marcus Lattimore Day" at a rally in Columbia attended by a couple thousand supporters. And Dabo Swinney, the coach of rival Clemson, offered some humbling and profound thoughts in support of the 21-year-old from Duncan, S.C.
"It took my breath away," Swinney said. "I was watching and it just breaks my heart. I mean, I just hurt for him and his family and his teammates. This is a guy that, to me, represents all the good things that college football should be about. He's a guy I know personally. He's a class young man and so is his family. I know how hard he has worked. "If there is anybody I would bet on it is Marcus Lattimore," Swinney continued. "I know it will be a long process, but I tell you what, I would put my money on Marcus Lattimore in a heartbeat. When he comes to terms with this, he will do everything he can to come back. My prayers go out to him and his family. I have been heavy-hearted for him. He is a winner in every regard. Hopefully we haven't seen the last of him from a football standpoint. He has been a great representative for his family and his university. I will lift him up in my prayers." Swinney about said it all. And it served as not just a testament to Lattimore the man, but a reminder that he is a man, not just an NFL prospect. There will be emotional challenges to face with his recovery, not just physical ones. It also was an important bit of pause for everyone overly-invested in the Clemson-South Carolina rivalry – or any in college sports that are too often marketed as life and death. Then Spurrier, 67 years old and long past the days of knowing better, got up and took the whole thing back into the gutter. "A lot of quotes came across the country and I read one today from the head coach at our upstate school," Spurrier said at Monday's rally, as if it was beneath him to mention Swinney or Clemson by name. "You know, that school that used to beat us a lot that doesn't beat us much anymore, that one [South Carolina has won the last three games in the series]. Usually when that coach up there talks about South Carolina it's a bunch of garbage and a bunch of BS usually. But I have to agree with him on what he said the other day." And with that, things went straight to Internet trolling. "I'm embarrassed for him," Swinney said later Monday of Spurrier comments. "That would be about the only thing I have to say about that." That was more than he even should have said. Dignifying such ridiculousness doesn't help. Score tied 35-35. Only 13 seconds remaining in regulation. Facing fourth-and-10 at your own 25-yard line. The choice is obvious: Punt the ball in such a way that no return is possible and take your chances in overtime. Last Saturday at Chapel Hill, North Carolina State did almost all of that. It missed the part about how to punt the ball. Instead, Will Baumann boomed a high kick that went 49 yards. Unfortunately for the Wolfpack, North Carolina's Giovani Bernard fielded the punt at the Tar Heels' 26, found a wall of blockers to his right and ran untouched 74 yards with just eight seconds remaining as UNC stunned its archrival 43-35. The special-teams score capped a wild game in which the Tar Heels jumped out to a 25-7 lead after one quarter. N.C. State then answered with 28 straight points of its own. So it's almost natural that North Carolina would score 18 unanswered in the fourth quarter to complete the stunning comeback. Spurrier is the one who started this, though. He's the one who couldn't see past whatever professional bitterness he and Swinney have toward each other. He's the one who couldn't resist one of his endless barbs directed at an opposing school that under proper circumstances can be entertaining, but in this case just took the focus away from Marcus Lattimore. Spurrier is what Spurrier is, his often unpleasant behavior is masked in one-liners, sound bites and lots of victories. Look, you win and generate some laughs and they'll always love you in sports. No one really cares if you're a good guy. That's always been the case and no one expects it's going to change. We aren't naive here. So while you'd think he'd have mellowed or matured over the years, the truth is all those winning seasons meant he's never had to grow up. Swinney may indeed talk garbage about South Carolina on the recruiting trail, which is seemingly what Spurrier is referencing. I don't know, but he certainly wouldn't be the first recruiter to try. I do know in an interview earlier this season with me, Swinney, on his own and without being asked a question about South Carolina, spoke positively about the Gamecocks program and Spurrier himself. He expressed pride and excitement that the state had two top 15-20 programs going at the same time. None of that is germane to this issue, of course. Swinney could be the worst of the worst in private, but on the topic of Marcus Lattimore he was incredibly thoughtful, attempting to lift spirits up while dampening down partisanship. Go re-read the quote; that wasn't some formulaic statement typed up by a media relations director. It wasn't a quick tweet about "thoughts and prayers." That was a real answer. Both Swinney [Alabama receiver] and Spurrier [Florida quarterback] played the game and have dedicated their lives to coaching the game. They know injuries. They know, far more than most fans, that gut-punch moment of a crumpled kid on the field, panicked parents in the stands and the hushed tones of a doctor giving a tough diagnosis [Lattimore faces extensive rehabilitation and there's no certainty he'll return to NFL promise]. Spurrier should've been gracious enough to see that shared experience in Swinney's words. If, for some reason, there is too much animosity there, Spurrier could've just held his tongue. It was Marcus Lattimore Day, not Steve Spurrier Day. Instead, he took it to the worst of the political game, where the other guy is never anything but a terrible person and even his good ideas are to be held in contempt. Instead he acted like the worst of the fans, obsessed with not just wins and losses but humiliations and insults, focused on slight differences rather than massive commonalities. Instead he took the collegiality out of college sports. The expectation is Spurrier will address his failure here. He's too smart and too experienced to not realize his mistake. Or else, hopefully there is still someone still capable of sitting him down and explaining it. College coaches like to fashion themselves as teachers and unfortunately on this one, a bad injury that was bringing out the good in everyone, Steve Spurrier's lesson was how not to act. • Did the long layoff undo the Detroit Tigers?